The Fisher Scientific Standard Vortex Mixer is a variable 10 speed heavy duty lab mixer that goes from gentle shaking to a vigorous high-speed mixing. This lab mixer uses a removable test tube cup that’s chemically resistant thermorubber. 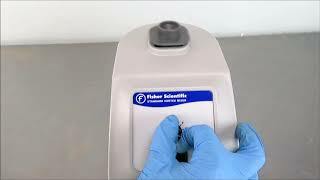 The Fisher Scientific Standard Vortex Mixer has a speed range of 300 to 2500 rpm with an orbit of 4.9 mm and is an ideal choice for continuous duty. This vortexer has continuous mixing or a touch mode, where you simply touch your test tube to the surface and lift when it’s finished. This Fisher Scientific Standard Vortex Mixer has been tested and performed to expectations. All of our lab equipment comes backed with our standard warranty. Should you have a question please don't hesitate to contact us.